It has come to my attention that The Voice is adding another celebrity judge. Well, not so much a judge as much as Christina Aguilera's little helper. Because I'm pretty sure all four original judges are still there. I know, it doesn't really make any sense, but hey, NBC is known to make some sketch decisions lately. 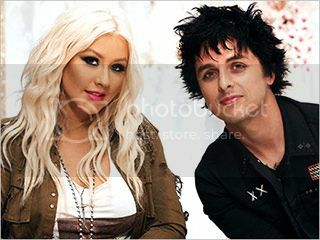 So according to EW, the role of Christina's Little Helper will be played by Billie Joe Armstrong. Yep, that's right, of Green Day fame. 1) This career move ruins any shred of punk-rock he had left. I'm not going to sit around and say Billie Joe Armstrong is the edgiest rockstar that ever lived, because he's not. There is a Broadway musical based on his songs. But he has been a part of a popular punk rock band since like 1990, and I feel like that gives you some sort of street cred (or whatever the equivalent of street cred is in the punk-rock scene). But being a part of The Voice? Sure, Adam Levine can pull it off and still be a rock star because a) he is fantastic and b) he never even remotely tried to be the rebellious, political, all-black-wearing frontman. He does ADHD commercials and sings like a dream and hangs out with Wiz Khalafia. Billie Joe I'm not so sure can come out on the other side of this. Even the die-hard Green Day fans (I assume they exist) will probably bail on him at this point. Let's just be honest. 2) His voice is the worst, and this show revolves around one thing and one thing only: voices. Why do we want him teaching others to emulate his? His voice is like...a teenager who got really, really upset about the fact that he has to clean his room and inexplicably decided to throw on a nose plug and drone dejectedly into a microphone about it. "Moy shaaa-doh's only won that woalks besoid me..." No. Put that nonsense away. You are literally 40 years old. Stop whining. 3) He is about as versatile as a whisk. A whisk does one thing and one thing only. You can't pick up pasta with it. You can't use it as a utensil. You can only whisk things because it is a whisk. That is what Billie Joe is like. He can play three power chords and sing songs that are only slight variations on his other songs. Seriously, go listen to any given Green Day song. Same thing over and over again. He can only Billie Joe things because he is Billie Joe. And not everyone wants to be Billie Joe. In fact, I would wager that no one wants to be Billie Joe. Why are we even doing this? For a person with a name that is so close to mirroring awesomeness (Billy Joel and Lance and/or Stretch and/or Neil Armstrong come to mind...), you would think he'd be better at life. Who's your favorite judge on The Voice?